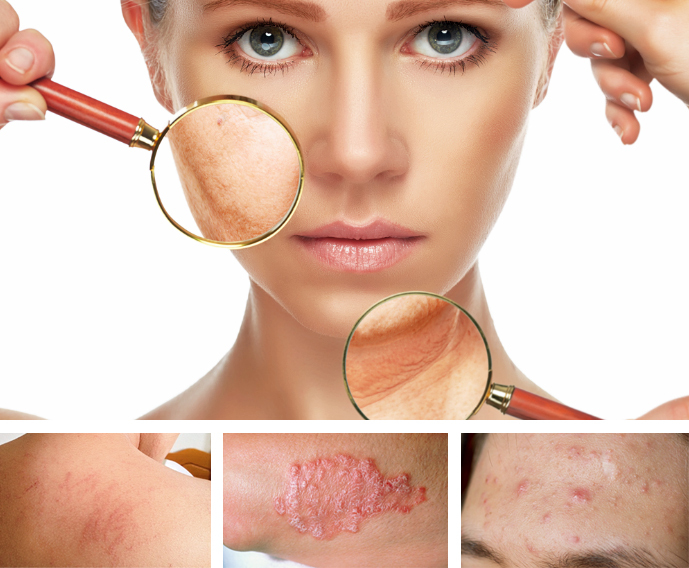 During the time of detailed initial consultation a physician-dermatologist will find out a reason of your disease emergence or exacerbation, examine the damaged skin, perform clinical dermatological tests (dermatoscopy, Wood’s lamp examination, skin biopsy with histopathological examination) and prescribe you necessary additional tests (laboratory blood and urine, microscopic and culture examinations). In the Innovative Dermatology Center we prescribe a local and systemic treatment based on the recommendations of the latest authorities worldwide, advise on how to take the best care of damaged skin. In case of disease exacerbation we apply a local therapy treatment with medication, prescribe injections, infusion therapy, lotions, specialized baths (hydrotherapy and balneotherapy), local and whole body phototherapy, cryotherapy and laser procedures. Long-term experience of the dermatologists working in the centre allows accurately determining problems of your skin and offering an effective treatment program drawn up personally for you.